Sochi hosts the XXII Olympic Winter Games (February, 7  23) and XI Paralympic Winter Games (March, 7  16) in 2014. The Olympics will be arranged in two zones: mountain cluster and coastal cluster. An Olympic express train will shuttle passengers between the Olympic Coastal Cluster located in Adler and the Olympic Mountain Cluster located in Krasnaya Polyana. Trains are scheduled to run every hour and will take approximately 34 minutes to travel between clusters. All the open-air skiing and sliding sport competitions will take place in the mountain cluster in Krasnaya Polyana. Within the Mountain Cluster, ski lifts will be used to transport fans to individual Olympic Venues. There will also be a media centre in the mountain cluster in Gornaya Carousel Ski resort. Sliding Center Sanki  Bobsleigh, Luge, Skeleton. Capacity: 5,000. 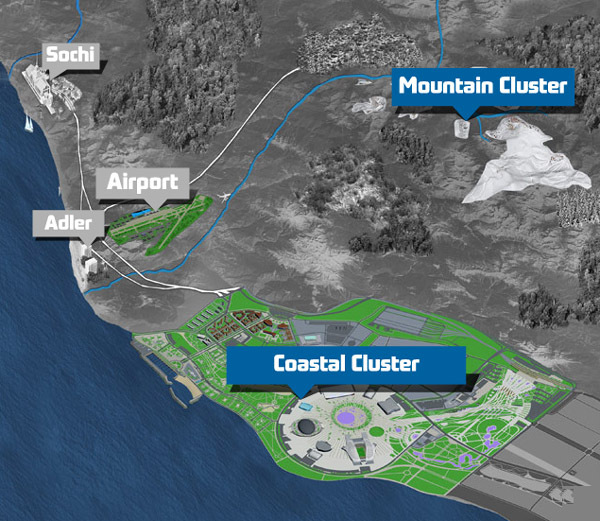 The Sochi Olympic Park is built along the Black Sea coast in the Imeretinskaya Valley. Olympic Park will be able to accommodate around 75,000 fans when full. All the in-door sport competitions will take place in here. Adler Arena Skating Center  Speed skating. Capacity: 8,000. Many Olympic-related events will also take place in the downtown Sochi area, which is located approximately 40 kilometers from the Coastal Cluster. A public transportation system, including buses and trains, can be used to access the Olympic Park from downtown Sochi.